Israeli and American architectural design teams this week toured the site of a future trans- boundary peace park in the Jordan River valley south of the Sea of Galilee as part of a six-day international brainstorming workshop held in Jordan. Participants in the workshop were faculty and students from Yale University in New Haven, Connecticut and the Bezalel Academy of Arts and Design, Jerusalem, together with Jordanian and Palestinian consultants. The proposed Peace Park was initiated by Friends of the Earth Middle East (FoEME), a non-government eco-organization with staff offices in Tel Aviv, Amman and Ramallah. The 300-hectare heritage facility seeks to encourage positive, neighborly interaction between the bordering Israeli, Palestinian and Jordanian rural communities by rehabilitating the river's polluted flow and utilizing its rejuvenated waters for shared and sustainable eco-tourism activities that offer local residents enhanced peace and prosperity through new job opportunities. The future park will be created on Peace Island at Naharayim (Al Bakoora), a rounded plateau protruding from undulating plains and ravines gorged into the Jordan's dry riverbed. 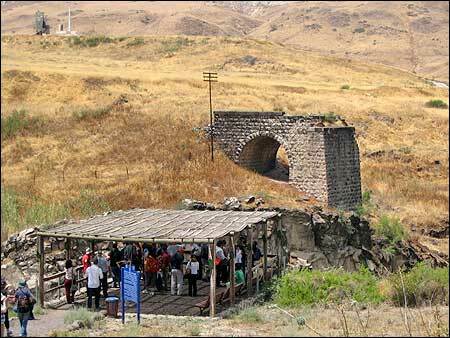 Remains of ancient Jordan River bridge, Jordanian outpost in background. A manned military observation post flying the Jordanian flag stakes Jordan's territorial sovereignty over Naharayim. This is defined as a "trans-boundary protected area" in the Israel-Jordanian peace treaty of 1994, which resolved territorial disputes along their international border. The "trans-boundary protected area" is an unusual entity on a fenced off security border on both sides of the river's embankments that restrict civilian access to the riverbed. 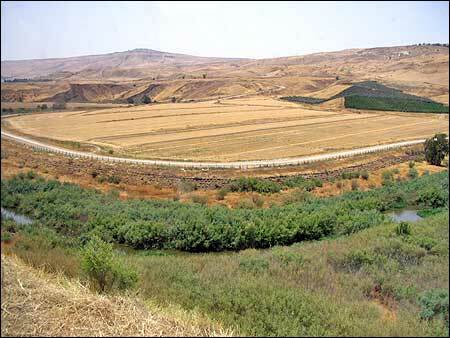 Practical arrangements allow Israeli farmers under a 25 year, automatically renewable land lease to continue cultivating land along the river's alluvial slopes and floor bed to which they had legal title prior to Israel's creation in 1948. Israelis can enter the area without a visa or passport simply by presenting their identity cards to the Jordanian guards stationed at the border crossing. Disused Rutenbereg hydro-electric power plant. The park's diverse topography links historical, natural and cultural heritage sites, explains Mira Edelstein, FoEME's Israel foreign media spokesperson, outlining the planned attractions. Some 250,000 local visitors and 50,000 foreigners with clearly defined recreational interests have visited these sites over the past five years. Mass tourism is not envisaged. Sites destined for restoration include a Mamluk wayside inn, an Ottoman Turkish customs house and three bridges dating from Roman, Byzantine and British Mandate times and British-built railway station. They share a landscape strewn with rusted steel shards of defunct rail line connecting Cairo via the Jordan Valley to Haifa and Damascus. A Visitors' Center is planned at the former hydroelectric plant established in1932 at the confluence of Yarmouk and Jordan Rivers by the Russian Jewish immigrant Pinchas Rutenberg with agreement from Jordan's King Abdullah I. It supplied 40 percent of British mandated Palestine's electric power before it ceased operations with the outbreak of the Arab-Israeli War in May 1948. The plant is a mix of disused concrete canals, dams, rusted steel generators, bridges, sluice gates and torn high voltage power lines. Derelict cabins that once housed the plant's employees will be refurbished as modern, short-stay eco-lodges for local and international visitors. An artificial wading lake and wet land habitat for indigenous wildlife and plant life will also be created by re flooding a dry, natural water basin once sustained by the Jordan River floodwaters. A bird watching sanctuary and lakeside feeding grounds will provide a rest area for some of the 500 million migratory birds pausing here before continuing their annual transcontinental flights down the Jordan Rift between Europe and Africa. A feasibility study has been completed with development costs projected at some $14 million. These will be equally shared by the Israelis and Jordanians who will develop their side of the park before joining up. Costs will be recouped from the income earned from the park's operating facilities. Relevant Israeli and Jordanian local government authorities have signed a memorandum of understanding and the Peace Park has enthusiastic backing from Jordan's King Abdullah II Fund for Development and the benefiting rural communities, confirmed FoEME's Israel director Gideon Bromberg and Jordanian director Abed Raman Sultan. "No picture postcard can reveal the site's fragmented and richly subtle narrative," said Yale University professor of Architecture and Urban Planning and American project director Alan Plattus, at a field trip to the site. "There is no one theme as the stories all compete for attention. Messy, complicated human issues must also find expression," he said, alluding to the bitter and conflicting Arab-Israel national aspirations that have left their mark on the landscape. "I am well aware of this element," Plattus said, drawing on his extensive work with adversarial issues and distressed communities in China and other places around the world. "Peace and water can be an integrating theme shared by Israelis, Jordanians and Palestinians, even though their stories have different historical layers," believes David Guggenheim, the Israeli project leader and lecturer in the Department of Architecture at the Bezalel Academy of Arts and Design. "Their authenticity must not be lost," he advised. Diana Balmori, noted New York landscape and urban designer of Balmori Associates and lecturer at Yale's Schools of Architecture and Forestry and Environmental Studies, said that efforts should "not beautify" the space. "Industrial ruins should be saved to show historical continuity and to create a system of connectivity without being intrusive. A coherent space was needed, but this was difficult because of the falling and rising contours formed by the valleys and hills, Balmori said. "But first, get the water cleaned up and running," she urged. 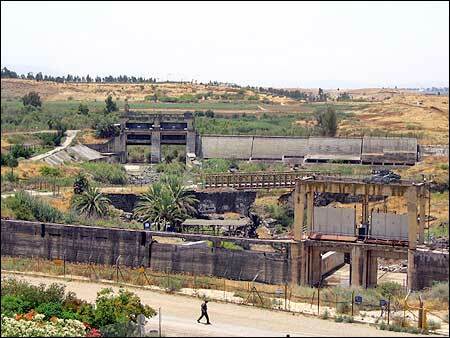 The Jordan Valley Peace Park will not be another Disneyland promised Bromberg. "We want visitors to engage in a dialogue with the park's heritage as part of a national and international learning experience." He assured local citizens that the experts welcome their input. Findings of the workshop and preliminary design concepts for the peace park will be presented next week at symposiums in Jerusalem and Amman.